When it comes to energy transfer, food is not all the same. Each link is only able to convert about 10% of what it eats into energy. 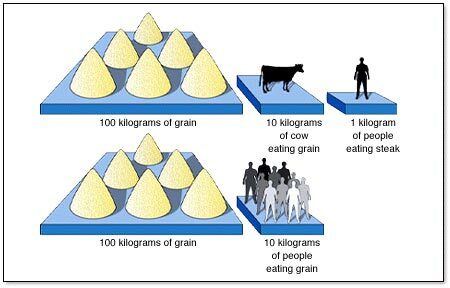 As the image below illustrates, directly eating plants is 10 times more efficient than first feeding an animal. Why feed grain to the cows when you can use them to make something as delicious as this fruit pizza?